Are you up for the San Antonio Food Bank SNAP Challenge? There are 3,812,561 people qualified for SNAP in Texas and 262,887 SNAP recipients in Bexar County. The challenge is trying to provide our families with healthy options for $4.50 a day per person in the household. The Let’s Go San Antonio team is working with families/children who are receiving services from the Food Bank or SNAP or both (52% receive both). The real crux of the challenge is how to teach and implement healthy nutrition choices when a person has a limited income. By deciding to participate in the SNAP Challenge, Junior League of San Antonio members, friends and families will have a better understanding of the issue that Let’s Go San Antonio is trying to tackle. How can a person, or a family, really eat healthier when on a budget. Knowing how to do this is vital information that is helpful for our Let’s Go Team to come up with ways to approach the issue and it will be helpful to understand the problems that Challenge participants face while on this limited food budget. Experience firsthand what many children in our community are facing on a daily basis. This is the population Let’s Go San Antonio is working with in teaching different ways to budget to choose healthier options. While participating in the challenge take pictures of meals prepared, shopping items found at area grocer’s that are cheaper and healthier options and share! It will be great for participants to learn from one another where cheaper and healthier options exist in San Antonio! Did you give it your best effort and it ended up being an epic fail? Share why it didn’t work for you. It validates how difficult it can be to realize what $1.50 per meal really means and why Let’s Go San Antonio is so important. The Food Bank told us that $1.50 is a national average for an individual benefit. The local per meal average is actually lower but we are using our national network’s number at $1.50. 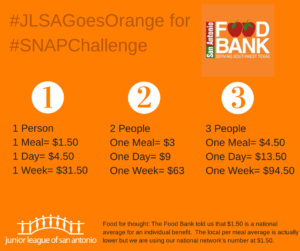 Share with us on Facebook, Twitter and Instagram and use #JLSAgoesorange, #sagoesorange, #jlsa #safoodbank #snapchallenge. Don’t use social media? Email us your thoughts on the challenge and photos of any attempts to participate. Make a pledge to commit the savings back to healthy activities for your family or give back to the Junior League of San Antonio Loyalty Fund or San Antonio Food Bank. Are you up for the challenge? Awesome, we look forward to hearing from you!